This document contains brief affidavit statements made by several free state supporters of the character and personal habits of William and Henry Sherman, and Allen Wilkinson, who were described as "intemperate" men. William Sherman and Allen Wilkinson were among the five pro-slavery settlers killed in the Pottawatomie Massacre in May, 1856. 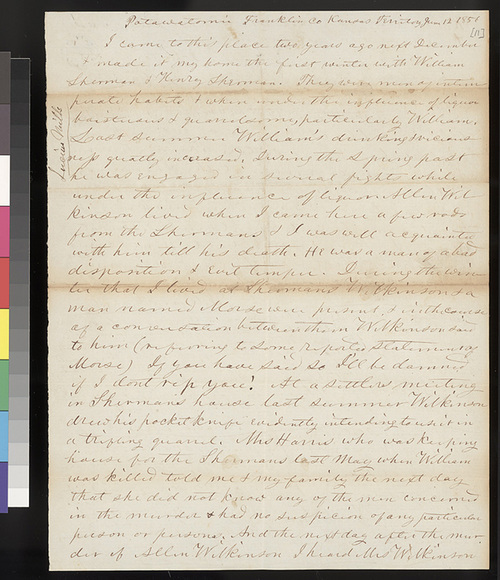 The document is written in the same hand (suggesting that its statements were either recorded or copied by the same person), and is identified as "Potawatomie, Franklin County, Kansas Territory, June 12, 1856."